History is being made again in the Stanley Cup playoffs. On the heels of the first back-to-back champions in two decades, the NHL will get a new champion in the salary-cap era that began in 2005. Among the Lightning, Capitals, Jets and Golden Knights, only Tampa Bay has won the Stanley Cup, making this the first time the final four teams have combined for one title or fewer. 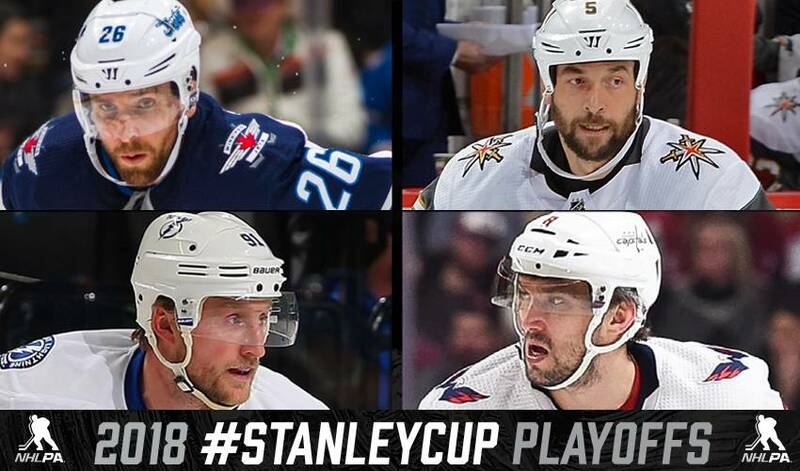 Tampa Bay is in the Eastern Conference final for the third time in four years, and Washington has made the playoffs 10 out of the past 11 seasons. Yet after one of Chicago, Boston, Los Angeles and Pittsburgh lifted the Cup every time since 2009, this crop of new blood is refreshing. "They're all good stories," Capitals coach Barry Trotz said. "The same old story sometimes can get old. Once in a while a new chapter is written, and it'll be good. This year there will be a new chapter." The next chapter begins with the Capitals visiting the Lightning on Friday night, followed by the Golden Knights at Winnipeg on Saturday night. It's a full turnover from the final four teams last year: Pittsburgh, Ottawa, Nashville and Anaheim. The Jets became the fourth and final team to reach the third round when they beat the defending Western Conference-champion Predators on the road in Game 7 on Thursday night. Winnipeg is the final hope for Canada's first Cup celebration since Montreal in 1993 and is in the conference final for the first time in franchise history. "Having some diversity amongst the league is great, and I think it just shows the competitive balance throughout the league," Jets captain Blake Wheeler said. "Having good young players is a great place to start and you see that the teams that have good young players have gotten good fast. So I think it's a good thing to have some fan bases have some extended post-season success. It just creates a better vibe." The Lightning are trying to create the vibe Hockey Bay hasn't seen since winning the Cup in 2004. They fell short in a six-game loss to the Blackhawks in the 2015 final with this core, led by Steven Stamkos and Victor Hedman. Even after missing the playoffs last year when Stamkos was out long term with a knee injury, Tampa Bay has plenty of recent playoff experience from recent runs and the additions of ex-Rangers players Ryan McDonagh, Dan Girardi and J.T. Miller. "We've been here in this situation before," Stamkos said. "There's no panic or nervousness. We're excited." Vegas hasn't been in any situation before, building off the best inaugural season in NHL history by beating Los Angeles and San Jose to reach the West final. Among the four good stories remaining, none is as remarkable as the Golden Knights, who pieced together players from around the league to get further than anyone expected. "I haven't been around a team like this," general manager George McPhee said. "This feels like more of a team than any team I've ever been with at the NHL level." McPhee's former team in Washington has the same feeling. The Capitals aren't as deep or talented as in years past, but they're in the East final for the first time since 1998, when McPhee was in his first season as their GM. "I've had some teams that have been very, very talented and they weren't necessarily the best teams," said Trotz, who is in the third round for the first time in 19 years as an NHL head coach. "I think the belief in the group, or the chemistry in the group, is the intangible and this group has a good chemistry about it." What excites Jets coach Paul Maurice most about the fresh teams in the conference finals is the hope it keeps alive in the remaining cities. And each one can legitimately believe its team has a chance to win it all. "That's the great part about competition," Maurice said. "So that's what's the most exciting thing is you don't know, right? There's not a five-time Stanley Cup champion that's just ran the first two series 4-0. It's up for grabs. It's right there."